Hello to surfers from all over the world. We are greeting you from the Aljezur Coast in Portugal. We welcome surfers of all ages, diversities, as well as expertise. What this means is if you are interested in trying out the sport of surfing, then stop by Aljezur Surf and see what we have to offer. Here at the Aljezur Coast, you can surf 365 days a year. Now, as for Aljezur Surf, we offer surf lessons to those who are interested in learning the art of surfing. We, at Aljezur Surf, started this surf school, back in 2005. 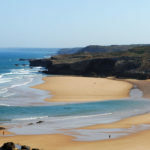 We wanted to promote the beaches of Portugal, in particular, the spots around Arrifana, Carrapateira, Amado, Vale Figueiras, Monte Clerigo, and all the other beautiful spots near the ocean. When you choose to surf with Aljezur Surf, you are taught by professional surfers, who have the expertise and skill to teach you how to surf correctly, and in a safe manner as well. The Arrifana beach is one of our premium spots for teaching surf class. It is big enough for everyone and the bay protects surfers from the cold winds that come in from the North. Although the surf season is all year round, the best times to surf is July and August, as well as September to November. During September to November, the offshore wind blows 24 hours a day, and the water of the ocean is inviting and warm. If you happen to be in beautiful and majestic Portugal, or are planning a trip to our beautiful country, then please do stop by Aljezur Surf, and partake in the surf lessons that we have to offer. We are experts in the sport of surfing and teach beginners, novices, intermediates, and also welcome professional surfers! You will be amazed at how much fun you have, learning to surf with Aljezur Surf in our beautiful European surf paradise.